Models have been hinting at a subtropical low to form north of Puerto rico for days now. It has now occured as the surface low looks strong enough to be classified. Yesterday a large plume of showers and storms were developing, but the surface low was still too disorganized. This morning the low is stronger and the deep convection is wrapping around the low. Look for this system to be classified as Otto later today. BTW - why subtropical and not tropical? This low pressure area formed from an upper air low, so it doesn't have all of the tropical characteristics one would normally find. It is possible that it could still become tropical if it sits over warm water long enough. 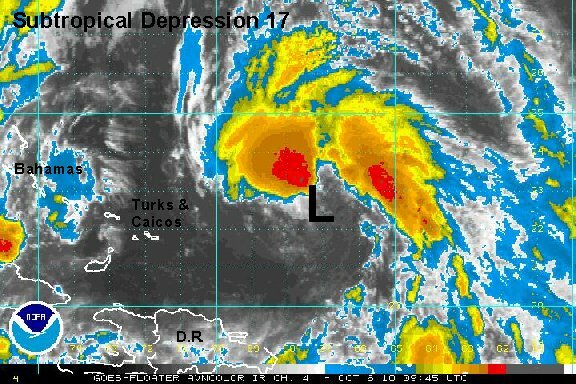 As of 6 am edt / ast subtropical depression 17 was centered near 22.3° N / 67.1° W or about 700 miles south southwest of Bermuda. Top sustained winds are estimated at 35 mph ( 35 mph nhc - 5 am advisory). Movement- north northwest at about 8 mph. Pressure estimated at 1001 mb. Forecasts take this subtropical system slowly northwest, then rapidly recurve it north, then northeast along a front. It will remain east of the Turks and Caicos and south of Bermuda. Our subtropical system has finally consolidated today. This morning's visible satellite imagery showed that there were a number of low level swirls. There is one low center now with an "eyelike" structure. Convection is well away from the center of circulation which is a sign of a subtropical system. 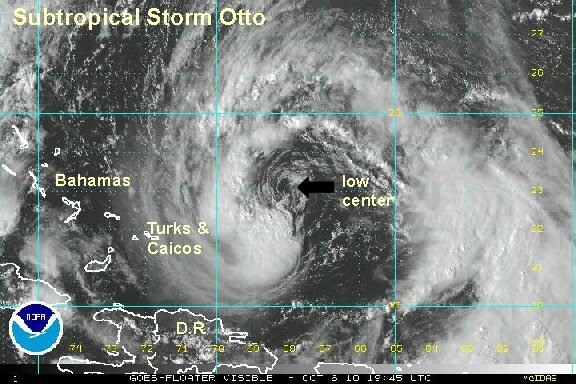 The low reamains far enough east of the Turks and Caicos so that there are little effects from Otto. The hurricane hunter found winds in a cluster of storms so that NHC is raising winds to 60 mph. We are going lower since the winds must be considerably lower in the cloud free areas. As of 5 pm edt / ast subtropical storm Otto was centered near 23.2° N / 68.3° W or about 665 miles south southwest of Bermuda / 215 miles northeast of Grand Turk. Top sustained winds are estimated at 50 mph ( 60 mph nhc - 5 pm advisory). Movement- drifting north 5 mpg. Pressure estimated at 990 mb. Forecasts take this subtropical system slowly north, then rapidly recurve it northeast along a front. It will remain east of the Turks and Caicos and south of Bermuda. Otto is more disorganized than yesterday. We'll be generous and estimate it at 45 mph. We are not in agreement with the hurricane center on wind speed at this time. We think that the winds of 60 mph sustained are overestimated. The 60 mph wind was found yesterday by the hurricane hunter and under a burst of convection southwest of the center. It is our opinion that this was a local thunderstorm wind and not representative of the circulation in general. Otto will need to seriously organize if it is going to become a hurricane in a few days as predicted by NHC. Otto is still holding onto its subtropical appearance with deep convection nearly absent from the circulation center. The closest buoys are only registering gusts to 25-30 mph with seas up around 11 feet recently. A few thundershowers are near Grand Turk Island. 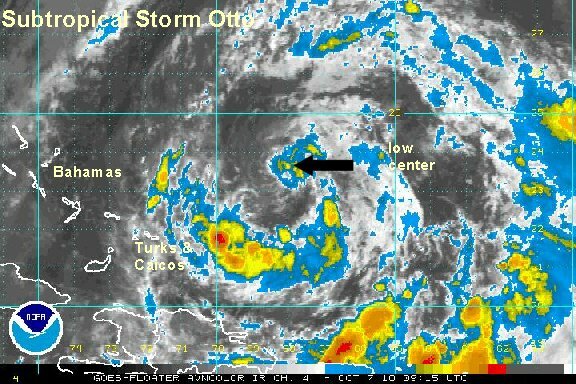 As of 6 am edt / ast subtropical storm Otto was centered near 23.6° N / 68.2° W or about 635 miles south southwest of Bermuda / 235 miles northeast of Grand Turk. Top sustained winds are estimated at 45 mph ( 60 mph nhc - 5 am advisory). Movement - drifting northeast. Pressure estimated at 992 mb. Forecasts take this subtropical system northeast along a front. It will remain east of the Turks and Caicos and south of Bermuda. Otto has become a warm core system as evidenced by the deep convection near the center of circulation. it is being sheared with the convection on the east side of the low center. We continue to estimate the wind speed considerably lower than the official hurricane center estimate of 60 mph. The hurricane center is no longer predicting that Otto will become a hurricane. A nearby buoy is still reporting seas at 11 feet east of the Turks and Caicos with winds 25-30 mph. 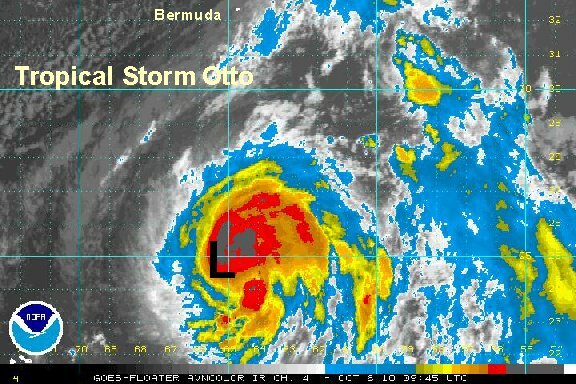 As of 5 pm edt / ast Otto was centered near 24.0° N / 67.6° W or about 600 miles south southwest of Bermuda / 280 miles northeast of Grand Turk. Top sustained winds are estimated at 45 mph ( 60 mph nhc - 5 pm advisory). Movement - northeast 6 mph. Pressure estimated at 992 mb. Forecasts take Otto northeast along a front into the central Atlantic. It will remain east of the Turks and Caicos and south of Bermuda. The hurricane center nearly made Otto a hurricane based on a warm spot on the I.R. satellite imagery. Since then, the spot has cooled some. We are also not convinced that the low center is vertically aligned yet either. Based on those reasons, we think that Otto has strengthened overnight, but not as much as the hurricane center's estimate. We'll know more when the visible satellite images come in over the next several hours. Buoys are generally measuring seas 8-10 feet, but none of those are near the low center. Winds at those buoys are also not very impressive indicating a small circulaton / areal coverage of the strongest winds. 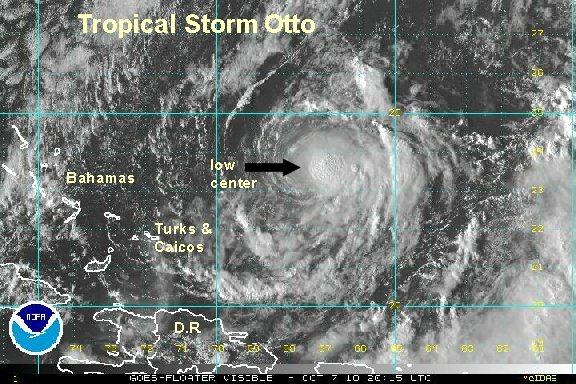 As of 6 am edt / ast Otto was centered near 24.5° N / 66.4° W or about 510 miles south of Bermuda. Top sustained winds are estimated at 60 mph (70 mph nhc - 5 am advisory). Movement - east northeast 14 mph. Pressure estimated at 986 mb. Otto is passing about 50 miles south of bouy 41049. That buoy has shown a rapid increase of seas to 17 feet with sustained winds just over 45 mph. It is our estimation that Otto is not a hurricane, although it is getting more organized. Remember wind gusts should be 10-15% over surface sustained winds. We just don't think that the sustained winds are hurricane force with gusts to 90-95 mph. As of 5 pm edt / ast "hurricane" Otto was centered near 26.8° N / 62.3° W or about 410 miles south southeast of Bermuda. Top sustained winds are estimated at 65 mph (80 mph nhc - 5 pm advisory). Movement - northeast 21 mph. Pressure estimated at 976 mb. Forecasts take Otto northeast along a front into the central Atlantic. It may affect the Azores as an extratropical cyclone several days from now. Otto's central dense overcast expanded some last night and cloud tops cooled indicatiing strengthening. We are still estimating Otto weaker than the official estimate. Otto's mid level and low level circulation still appear to be severely tilted. We think that Otto may have briefly had become a hurricane in the middle of last night. Since then, cloud tops has started to warm. Otto continues to acclearate into the open Atlantic in th general direction of the Azores. The exact placement of the low is still a little uncertain and visible satellite images will help in a few hours. 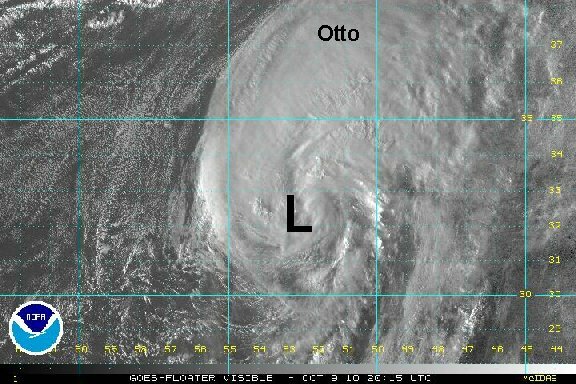 As of 6 am edt / ast hurricane Otto was centered near 29.2° N / 58.5° W or about 430 miles east southeast of Bermuda. Top sustained winds are estimated at 70 mph (85 mph nhc - 5 am advisory). Movement - northeast 24 mph. Pressure estimated at 977 mb. 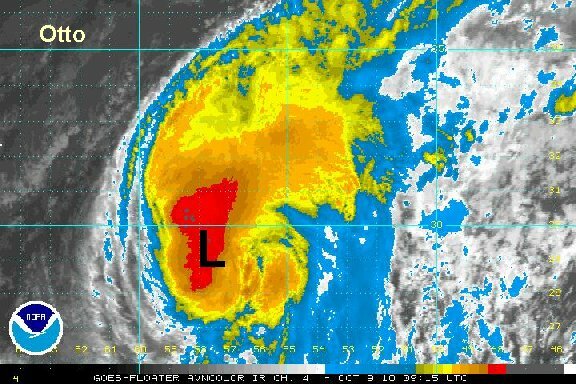 Otto is rapidly heading into the central Atlantic losing its tropical characteristics. Cloud tops are warming near the circulation center and the low is expanding in areal coverage. These are signs of a tropical cyclone becoming extratropical. We think the low is weaker than the official estimate. This will be our last update on otto. 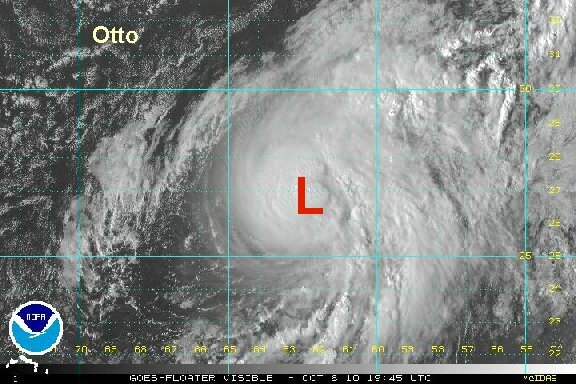 As of 5 pm edt / ast hurricane Otto was centered near 32.4° N / 52.6° W or about 710 miles east of Bermuda. Top sustained winds are estimated at 60 mph (75 mph nhc - 5 pm advisory). Movement - northeast 32 mph. Pressure estimated at 984 mb. Forecasts take Otto northeast along a front into the central Atlantic. It may affect the Azores as an extratropical cyclone a few days from now.